…but don't be afraid to ask! 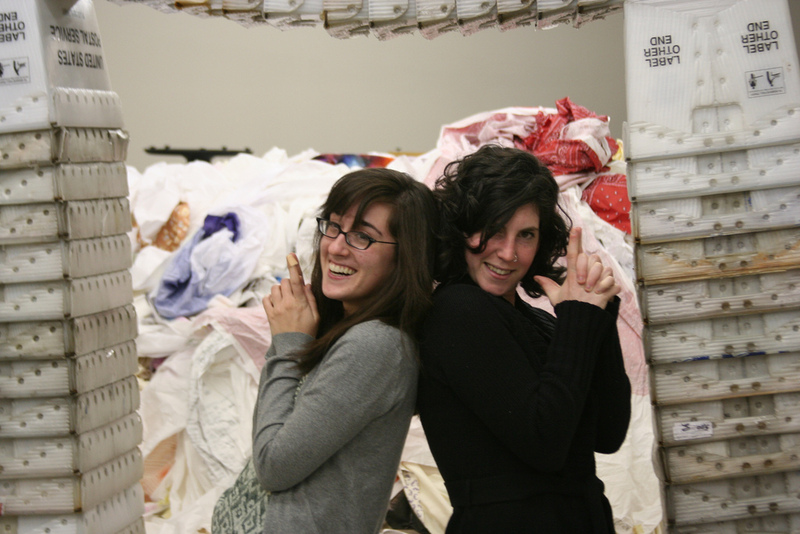 Starting next week, I'll be profiling Spoonflower staffers here on the blog, including the angelic Stephanie and Danielle at left. If you have any questions you'd like to see me ask our printing, shipping, engineering or office staff–or any strong opinions about who should be first–please let me know in the comments. Then check back next week for the first of the Spoonflower staff interviews! Have you Heard of Sprout Patterns? 1. Is there anything the engineering/printing staff can do to improve the print registration, so that it doesn’t come out so skewed to the selvage? I’m expecting this one to be a somewhat forlorn hope. 2. Are there some pre-defined landmarks for the site (and its tinkerers-behind-the-scenes) to reach before coming out of “beta” status? Or is it just going to be the day that Stephen (or whoever) finally gets bored of seeing the word beta over the title (or a commercial reason arises which forces the issue)? 3. How easy/hard would it be for Spoonflower to support in-house axial rotation (and reflections) for designs? I.e. so that, if the designer allows it for a pattern (since it would be silly for some things), the customers can choose which way round on the fabric it will print – as that makes a big difference for anything other than swatches. I thought it just possible that the printers might already have this feature built in. Otherwise it would require more coding. Obviously designers can do it for themselves anyway. It’s the potential customers who might currently be being put off by seeing the wrong orientation of a design for their particular application. Did they have any notion that this was the job they’d be doing or is it a complete departure from any previous work, training or ambitions they might have had? Thanks for the suggestions, SEF. The general questions you asked seem suited to an interview format, but I’ll certainly pass along your more technical and less personal questions to engineering. 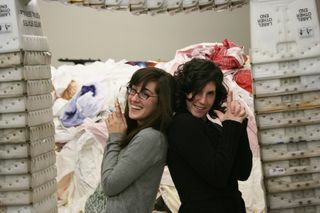 What do Spoonflower staff do with all the fabric of the week FQs, toys, skirts etc etc that they end up printing and making? Eg is someone going to take a toy or two home and love them very much? Does Mr. Beck wear his skirt to work or around the house often? Or do the bits and pieces get given to a charity or what? I have a question! I used to work in a print shop. The ridiculous amount of waste was really difficult for me to deal with. I found myself collecting tons of “accidents” and “misprints” and hoarding them in my closets at home. Do you have any collectors there? Anyone who regularly roams the press trash in the evening and comes out with treasure? How many patchwork quilts are currently in development? Also. Who is in charge of networking and when will they be contacting Project Runway for a Spoonflower challenge? I’d like to see that episode. What we do with misprinted fabric and contest fabrics photographed for the emails might be worth a post all on its own, Jendotgrant and SEF. Thanks for the suggestion! Danielle’s interview made me wonder whether she (or other members of staff) had any input into the choosing of the new silk-cotton combination fabric. 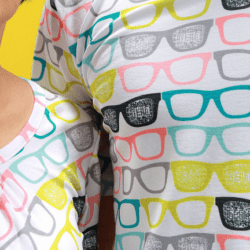 SEF, when we’re trying to decide on a new fabric to add to our list of options, we always consider the many suggestions we receive from Spoonflower customers as well as staff suggestions. Most of the staff who sew at Spoonflower are definitely thrilled about this new introduction, though. It’s a new favorite among us, and I hope it will be for everyone else soon, too!